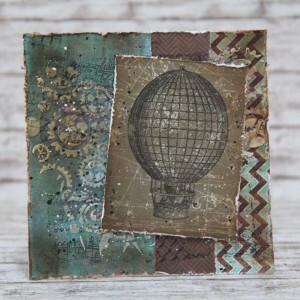 today I have for you some inspiration for mixed media cards. 1. Here are at background new papers from Galeria papieru. 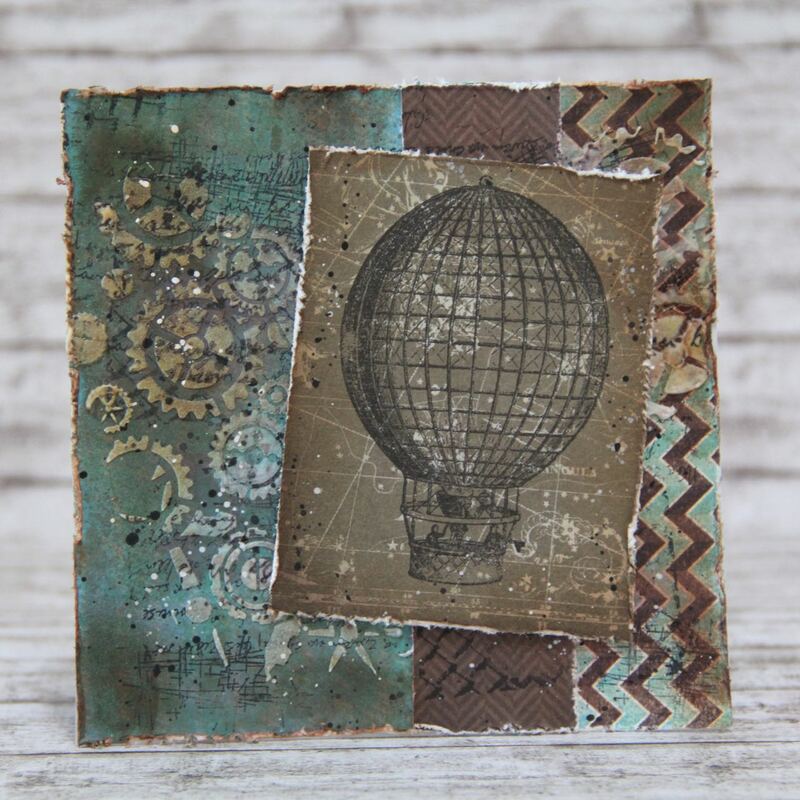 Balloon is stamp from La Blanche and it is stamped on 7 dots studio paper. Stencil is my own this one I designed. I used sprays from Lindys stamp gang and Tattered angel. This entry was posted in Cardmaking and tagged 7 dots studio, cardmaking, Finnabair, Indigoblue, La Blanche, Lindys Stamp Gang, mixed media, Prima Marketing. Topic for this week is SPLASH. 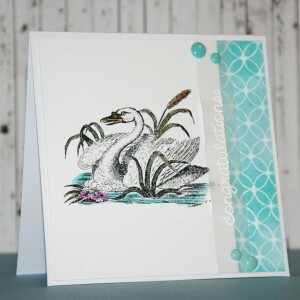 I do not have any summer stamp yet but I found this beautiful swan. It can be together, summer, swan, sun, water ….. 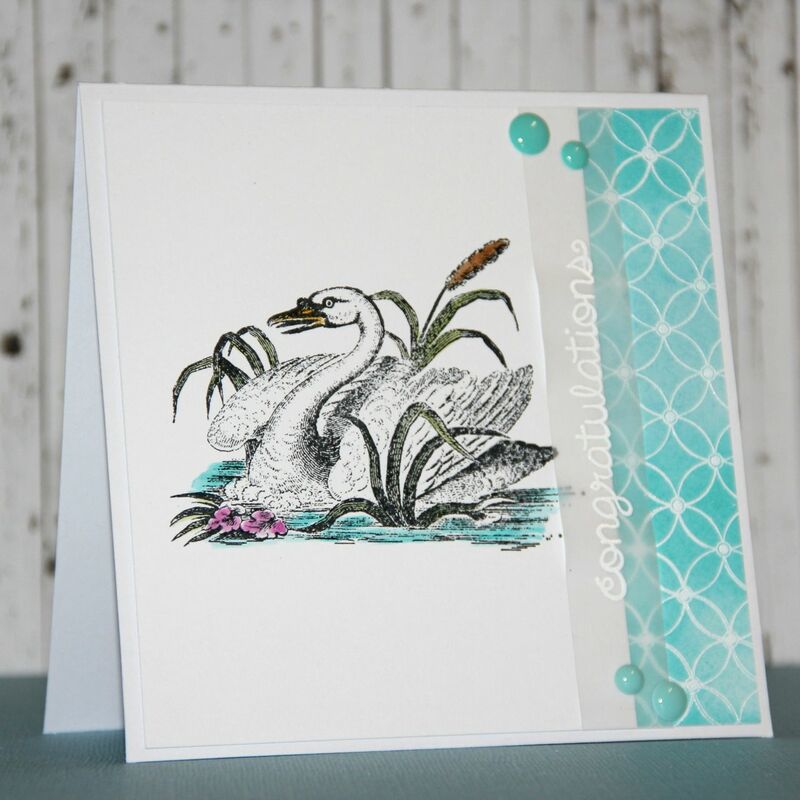 So I made card with swan – stamp is from La Blanche. I stamped it with memento ink and coloured with distress inks Than I stamped with VersaMark Hero Art background and with white embossing powder heat embossed it. Than I used broken china and peacock feather Distress ink to make colour background, from such prepared sheet of paper I cut just stripe. And at the end I add sentiment again heat embossed on vellum. 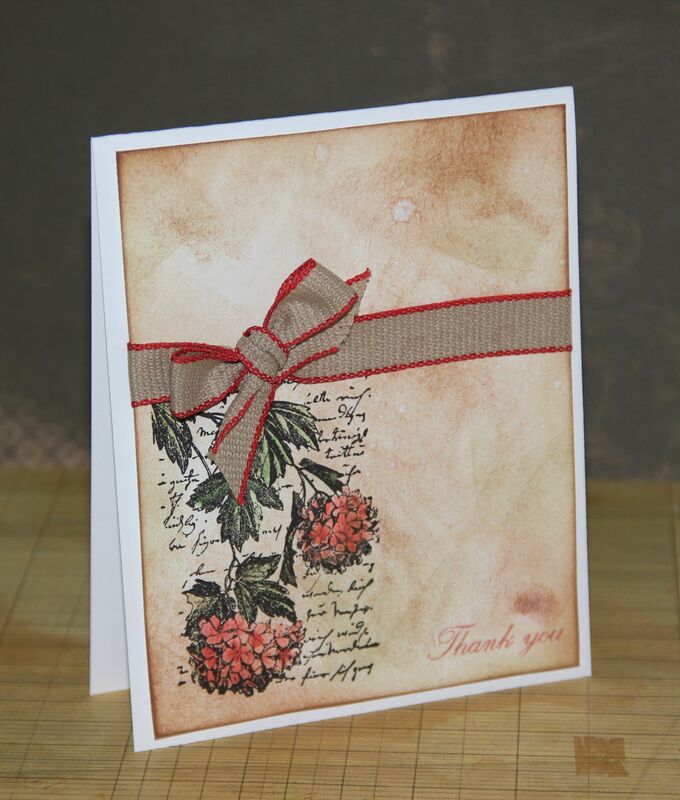 This entry was posted in Challenge and tagged cardmaking, Challenge, Distress ink, Hero Arts, La Blanche. For muse challenge we have very nice card as inspiration. I made little bit different card – in vintage style, I do not have so many english sentiments so I used my sentiment Thank you. Stamp is from La Blanche coloured with water-colour pencils, background is made with 2 distress inks and ribbon is from England. 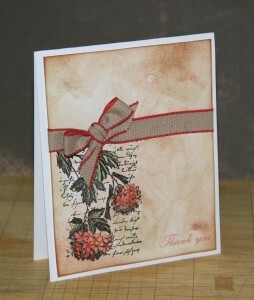 This entry was posted in Challenge and tagged cardmaking, Challenge, Distress ink, La Blanche. I love LaBlanche stamps, very detailed and high quality silicone stamps from Germany. I have lot of them and now its time to try. I made this three cards with one stamp – rose – technique is easy – VersaMark clear embossing ink, white embossing powder, than distress inks and some sentiments. Oh and butterflies are made on my Silhouette Cameo cutting machine. 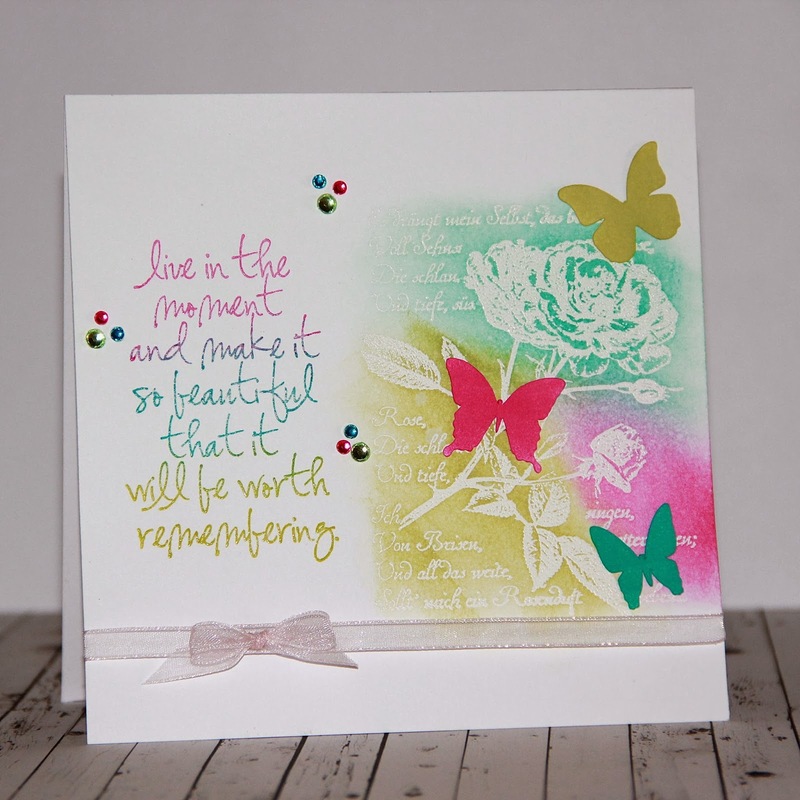 This entry was posted in Cardmaking and tagged cardmaking, Distress ink, La Blanche.